This serves as a fine counterpoint to the doom-and-gloom, "the world is going to hell in a bucket [because of new media]" point of view from Andrew Keen I posted on recently. As one of the founders of the very successful local technology marketing firm TechTarget, Paul Gillin could be forgiven for being overly zealous about new media and social networking technologies as marketing tools. I recently saw Paul speak at a meeting of the Sales and Marketing roundtable of the Mass Technology Leadership Council, and found some of the ideas covered that day around adding communications channels with our customers via new technologies to be very worthwhile. At this meeting, Paul plugged his book, "The New Influencers: A Marketer's Guide to the New Social Media," which I recently read with interest. While I enjoyed the freshness of the ideas and his obvious mastery of the subject matter, I found some gaps in Gillin's book around how social media companies like Fark, BoingBoing, Digg, and others are actually making money. Maybe it's my "upbringing" as a CPA, but when I can't get my head around how a business model works (i.e., generates profits) and I see investors lining up to throw money at them, I get concerned about a bubble (2001 says "hi."). 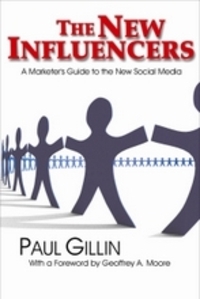 The real usefulness of Gillin's book to me is as a primer as I seek to understand the best way to direct marketing effort and investment into new social media, such as blogs, podcasts, search engines, tagging, etc. It catalogues tools of the trade and where they might be usefully applied, and I hope to adapt some of the tools and techniques to fit a professional services marketing model, which is far more about conversations than broadcasts.